Sorry for the errors in the last 2 days. I upgraded the server to a new hardware. If you are still experiencing errors with the website please let me know. The issue has been resolved, all services should worked as before or even better. Happy New Year 2015. Wishing you a Happy New Year with hope that you will have many blessings in the year to come. RoomProtector v2.0 is just released. The new version now included the Greeter, Welcome Back, and Poster. RoomProtector supports multiple rooms, so you can have different greeter for each different room. I'm still currently in the process of migrating the servers. Currently upgrading the servers to SSD drives. Please stay tune if you're experiencing any delay with the server. Few applications got updated to the new version, if you're using the older version. Update your copy today. Send me an email or contact me via live chat if you have any questions. Happy Thanksgiving 2014! Wishing you all the Hope, Wonder, and Joy that the holiday season can bring! SERVER UPDATE: I am currently upgrading some servers to Window Server 2012. Expected downtime: 0 minute but if you're getting error during the process please let me know. Thank you. 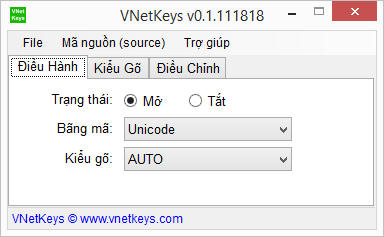 VNetKeys - Vietnamese Keyboard Input that works with 32-bit and 64-bit. Sorry, it has been a while since I last updated the site. I've been busy working on a new product called "VNTalk Messenger", it's soon will be available to you all. It's going to be an exiciting product. VNTalk allows you to keep in touch with many people through text, audio, video and multimedia chat. In some ways, it’s whatever you make it to be: the way you keep in touch with faraway loved ones, or the back channel to that boring meeting. The project is currently self funded, and I have been working really hard on it while learning it. I hope that you will like this new chat application. Yes indeed, it will be the .NET Framework application. One of my favorite feature is the Auto Seen Bot, I just recently added to the HDMediaPlayer v2.4. The language text can be changed in the Message => Show all languages. I hope that you will like this feature. For those don't have the HDMediaPlayer, and would like to have this seen bot. It will soon be in the separated application as a free gift, stay tune for additional information. Let me know if you have any questions. HDMediaPlayer v2.3 is just released today. There are many new features are available in v2.3, you definitely will like it. To learn more about the latest version, click here to see the completed list. 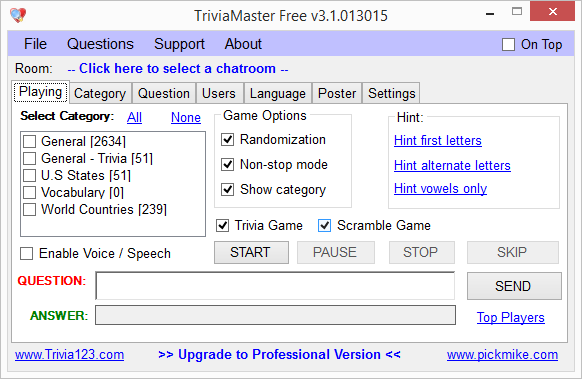 If you owned the professional version, in the software go to About -> Check for update. Stay tune for more features in HDMediaPlayer. I know what it takes to analyze, develop and support complex software systems. I deliver solutions that help customers run their business every day. Let me help you too, call Mike 909-742-9133 or email me today and let me help you with your projects.